Creating a romantic picnic menu can put a lovely spin on a popular summertime outing. Make the most of the special outdoor meal by merging romantic themes with stellar recipes that are perfect for the occasion. Picnics are innately romantic as they offer an occasion for sharing a charming meal in an intimate setting. Creating romantic picnic menus involves more than putting together favorite picnic recipes for summer. A theme can help you come up with thoughtful ideas that make dining al fresco a dreamy experience. Use the theme ideas to brainstorm foods for the outing. Regional themes can inspire a number of visions that can help you bring the event together. French, Italian, Mediterranean, and Greek themes are perfect for their ties with romance. You may also opt for a region that is specific to the individual. If you are preparing a picnic for a person who dreams of vacationing in Australia, why not use popular recipes from this country in your plans? This romantic theme is a wonderful choice that can yield creative recipes for picnics. Nothing is as romantic as taking time to show deep appreciation for your significant other. Personal themes have a broad spectrum that makes the picnic a unique event. How do the themes translate into food and romance? Examples of romantic picnic menus can help bring the whimsical ideas to fruition. Examples are organized by general theme: regional, personal and period themes. Choosing just one regional theme is difficult considering the romantic options but a Mediterranean meal is an appealing choice. Romance and wine are seamlessly woven together. Pair them with a romantic outdoor picnic and you have the recipe for passion.The wine that you choose for the picnic can give you ideas for recipes. The following is for Riesling, an unusual choice that has a nice balance of acidity and sweetness. Gruyère cheese as an appetizer, paired with red and green grapes. Follow a food wine pairing chart for more ideas on other wine-guided outdoor meals. While many of the period themes are appealing, the romantic medieval picnic is a great example because it is unusual and dining during the medieval era requires few utensils and little refrigeration. The pastoral dining experience can be a memorable retreat from modern stresses. 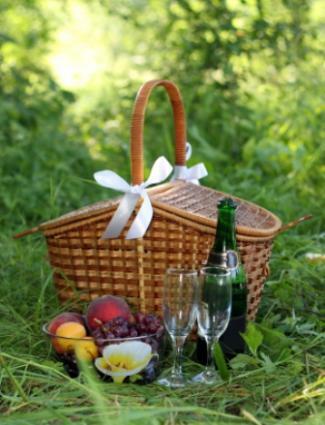 Find more ideas for a romantic picnic on Aphrodisiac Recipes and Perfect Picnic Menu. No matter if the outing is a big affair or an intimate meal with someone special, thoughtful preparation and a little creativity can leave a lasting impression. Romantic picnic menus make more than meals; they make lasting memories.